Every single morning, before heading to Salesflare, I shower, get dressed, do my daily Duolingo courses, eat breakfast and walk the dog. Yup, Duolingo is part of my daily routine. And it is for (probably about 10–20) millions of other daily active users. Is that even possible? How is that possible? Luis saw there was language learning software out there, like Rosetta Stone, but it was prohibitively expensive, and it therefore didn’t help to close the education gap. Based on its mission, Duolingo has been attracting users, employees and investors ever since. Of course, to survive, Duolingo had to make money in some place. They chose to do this based on ads, monthly subscriptions that remove the ads, in-app purchases and the Duolingo English Test. They believed that software was perfectly fit to offer a personalized experience to every single language learner. Now how do you make that happen? And they mean it. 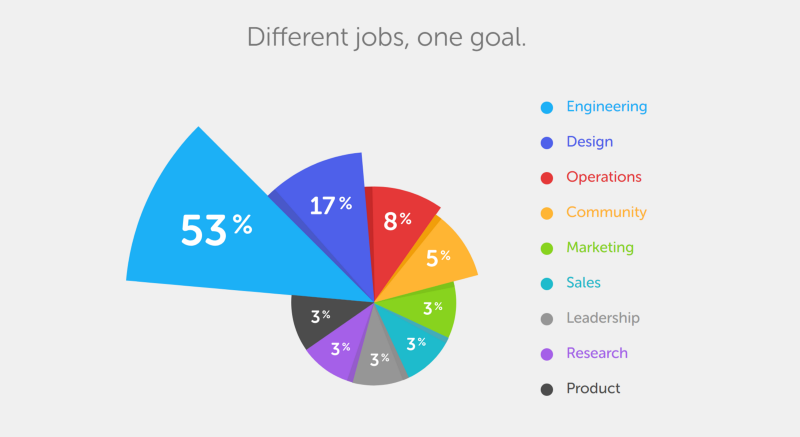 More than 3/4 of Duolingo’s team works on engineering, design, product or research. This is in stark contrast with the other big language learning software player out there: Rosetta Stone. Only slightly more than 1/4 of its team works in these same departments (based on LinkedIn Premium data). It’s the classic battle: product organization v.s. marketing-sales organization. They get more interest in searches according to Google. 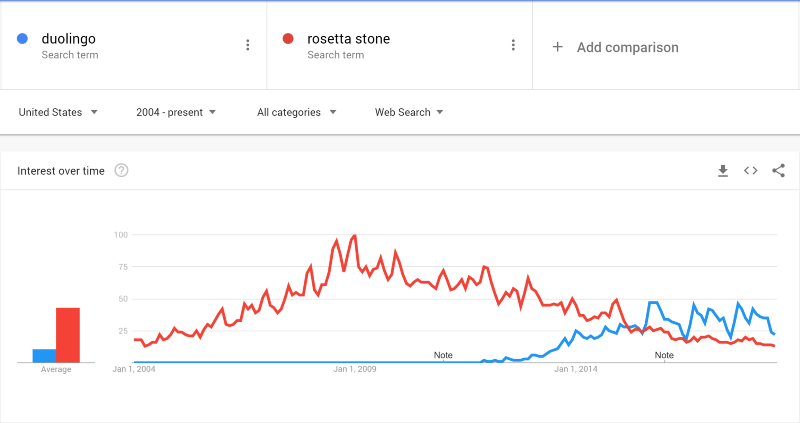 Interest shown on Google search for Duolingo and Rosetta Stone. And grow their company at a much higher rate according to LinkedIn. … while Duolingo grew by 33%. As a mathematician and computer scientist, Duolingo’s co-founder Luis von Ahn did not always believe in the power of product design. But now, when asked for the most life changing book he’s ever read, he’d tell you it’s “The Design of Everyday Things” by Don Norman. Since he’s read the book, he’s obsessed with how products are designed. Each team is responsible to improve the metrics linked to its specific goal by organizing product experiments. The Duolingo homepage already gives a good idea of some of the ways its product is built to incite the right user behavior. 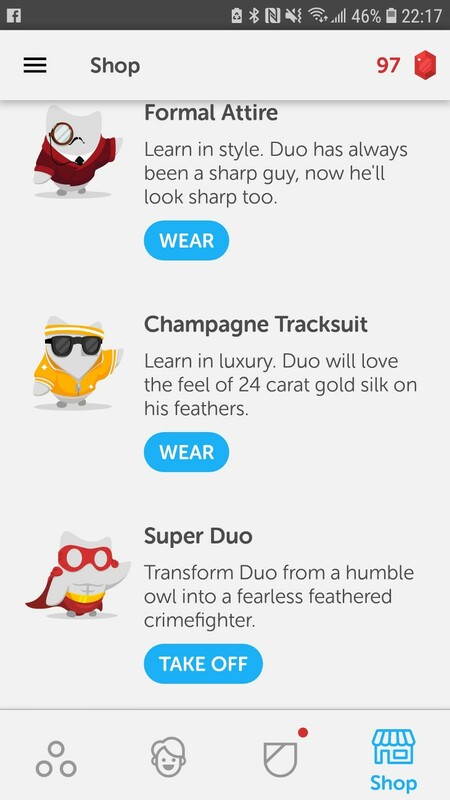 Screenshot from the Duolingo homepage. The fact that the software doesn’t even use “hearts” anymore, and doesn’t mention badges or its in-app coach “Duo”, is a clear example of how quick and often Duolingo runs product experiments to improve the product. Based on these experiments the team introduced “soft walls”. Those are optional pages that ask people to sign up, but still allow them to hit “Later”. Finally, after a series of lessons, there’s a “hard wall” that requires users to sign up. 🛑 The team found that the performance of this wall was actually also improved by the presence of the “soft walls” as users were already primed to sign up. 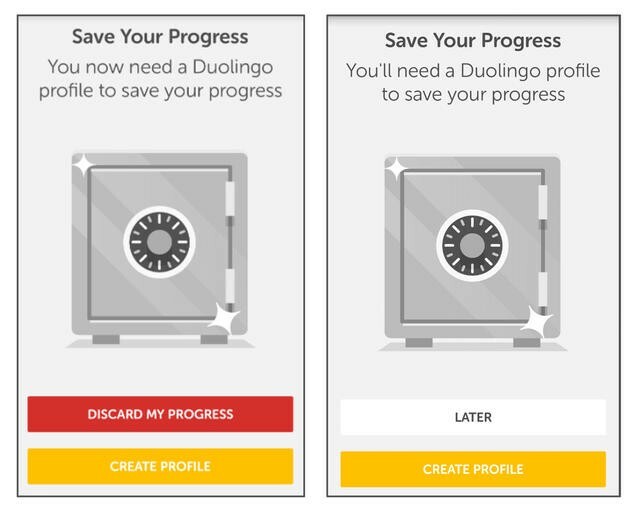 In the process of introducing the “soft walls”, Duolingo made a mistake it later had to correct: the team created a big red “Discard my progress” button. What it found later is that this button actually invited people to click on it instead of scaring them from clicking. Replacing it afterwards with a more subtle grey “Later” button made performance shoot up. Another important product aspect the Duolingo team experimented with a lot, is the concept of the “streak”, which it borrowed from the gaming industry. The power of the streak on retention is so strong that the Duolingo team spends a lot of time optimizing it. It mainly makes it harder to lose the streak and make it easier to get it back by doing some exercises. On top of that, the team was able to improve conversions over notifications by around 5% just by changing the copy and by testing different timings. In terms of timing, the team found that 23.5 hours after their past learning session was the best moment to remind people to do their next session, as people usually learn at the same moment of the day. 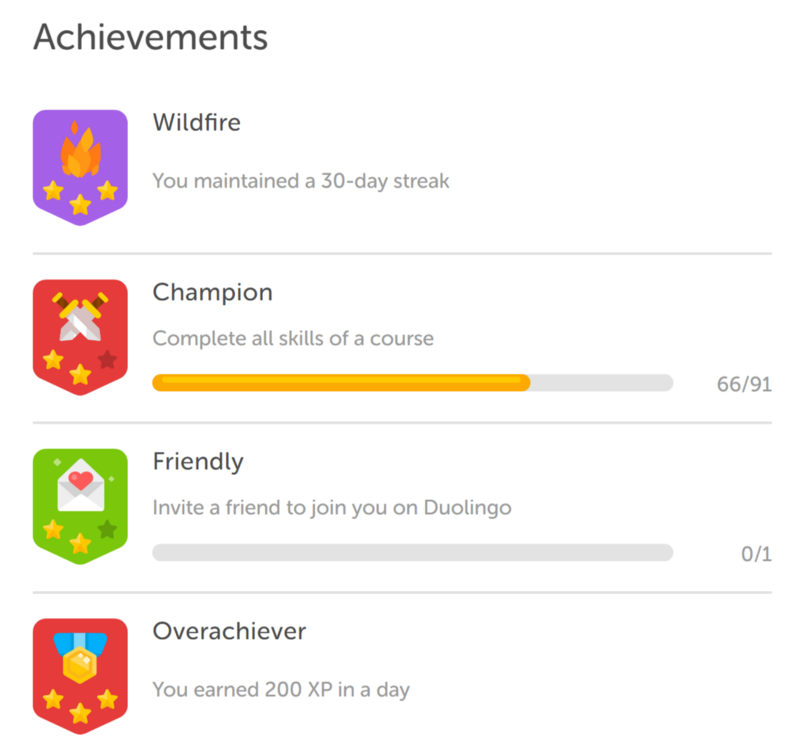 A classic gamification aspect the Duolingo team added is badges. The first version of the badges system by itself (even without badge tiers, i.e. the stars in the above screenshot) already increased daily active users by 2.4%. But it also stimulated very specific positive behavior: it increased purchases from the Duolingo store by 13% and increased the amount of friends added by 116%. 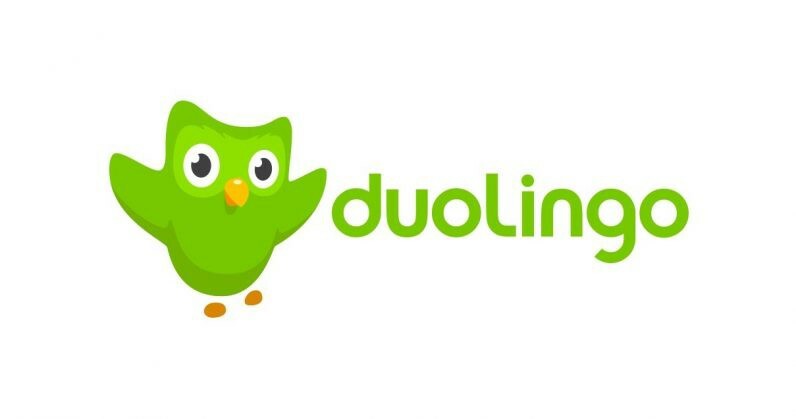 One of the more controversial experiments within the Duolingo team was the introduction of the in-app coach called “Duo”, the supportive owl mascot. Some team members loved it, some disliked it and found it annoying. Duolingo understands that stopping their improvement process means standing still. And standing still means failing in the end. On the other hand, there’s an infinite amount of product experiments one can run and mindlessly starting experiments can prove to be a total waste of time. That’s why the Duolingo team diligently keeps track of all possible product experiments, prioritizes them, and then plans them in accordingly. What’s the potential impact of the experiment? 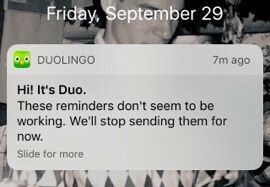 The Duolingo team even decided that experiments with an impact of below 1% are not worth it. How long will it take to run the experiments? Finally, when planning, they make a consistent choice to not ignore the small experiments in favor of the big ones. They believe that it’s the succession of an enormous amount of tiny improvements that leads to big results. Way to go, Duolingo! 🙌 Keep going strong on your awesome mission.